We have some particular issues in London. Foxes are becoming increasingly prevalent in London and carry Sarcoptic Mange; our milder winters allow fleas and even ticks to be active all year round and the Lungworm parasite is now being seen more frequently in the UK. We therefore recommend that all adult dogs and outdoor cats are routinely wormed with a tablet, such as Milbemax, every 3 months, as recommended by the British Small Animal Veterinary Association. 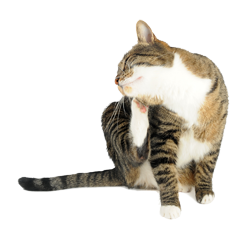 Outdoor cats should have regular flea control with a spot-on such as Frontline. 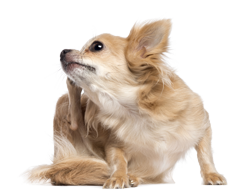 We suggest that dogs have an all-round flea and mange spot-on treatment such as Advocate or Stronghold every 1-2 months, with the addition of a tick control treatment such Frontline or Prac-Tic in the summer time ( more frequently for dogs having access to forested areas). Lungworm is being seen more frequently in the UK and is contracted by dogs eating infected snails. The spot-on treatment Advocate will eliminate this parasite. All pets travelling to Europe are advised to take extra parasite control as there are significantly more tick and fly-borne diseases in Europe. We recommend all dogs travelling to the South of France, Spain, Italy and Greece use a Scalibor collar to protect against Sand flies that carry Leishmania as well as their regular monthly tick treatment. We do not have Heartworm in the UK and routine prevention is not required. Any dogs travelling to North America and Southern Europe should take a preventative treatment every month such as Milbemax. This should start before leaving the UK and continue for one month after returning.